Our Bodacious Dog Mom Life: It's The 4th Of July. And, I Have A Pile Of Wood To Work With. It's The 4th Of July. And, I Have A Pile Of Wood To Work With. All of our fur-kids are terrified of fireworks so this weekend, the actual 4th of July, and next weekend, we'll be staying put. It's the perfect time to gather some wood, go through the totes of wood we already have, and create some cool DIY Dog Mom Projects to sell. Amid all of that, we'll probably have a pit fire in the backyard with a few of our neighbor friends who have become family, sip some wine, and make a few more memories. Yes, this is how we spend our 4th of July. It's how we've spent the 4th of July over the past 4 or so years. The furthest we're going is our backyard. During the day, on July 4th, we're heading over to our neighbors house to enjoy a cookout and maybe a little swimming in their pool. 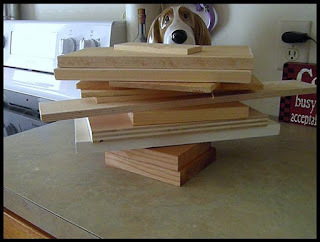 And with all of the time spent at home, there's plenty of time to work on DIY Dog Mom Projects. And bake biscuit love. And catch up on housework and small projects around the house.